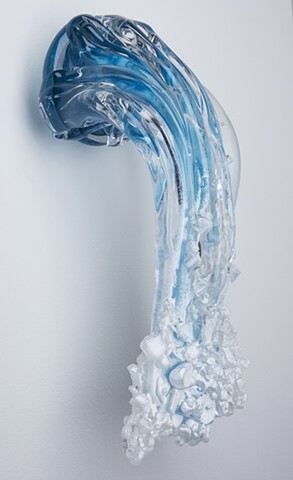 Blown and hot sculpted glass waterfall. Water qualities constructed by adding freshly hot bits of glass from the furnace and chunks of clear glass with white glass powder for the falling water foam. The waterfall is mounted to the wall with a custom fabricated steel bracket which is included with shipment.